2. Where to find contact information. 3. Documenting first contact and inspection date. 4. 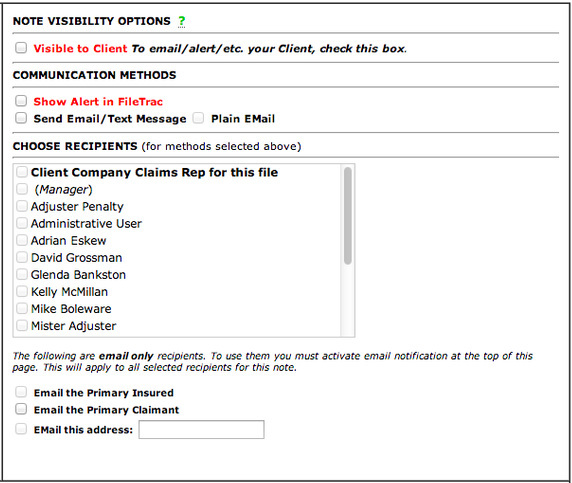 Adding notes to FileTrac and sending emails/alerts. 5. 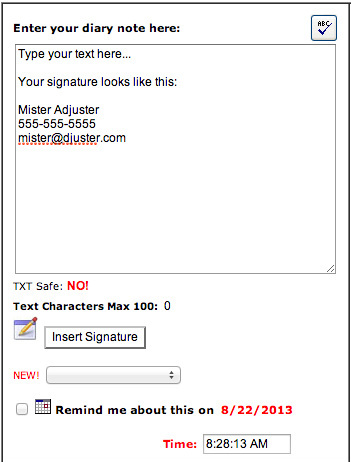 Adding Timelog entries for accepting claim and first contact. 6. What if I can't make contact? Contact with the insured, claimant and/or their representatives must be made and documented within the first 24 hours of assignment. Hovering above the icon represented by a piece of paper, magnifying glass and pencil with your mouse cursor will popup a box where you can enter this information. You can manually enter a date or choose it from the calendar as shown above. Be sure to click Update to save your changes. 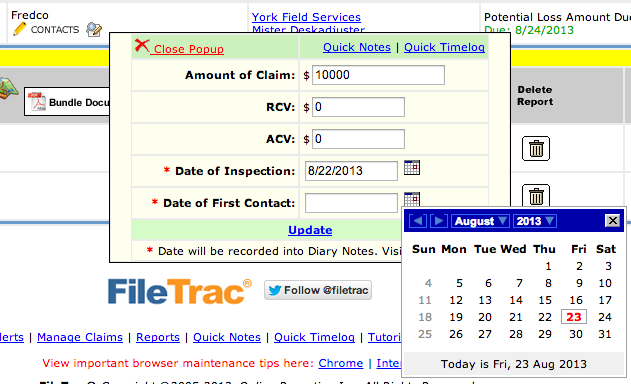 The notes section can be accessed from any claim by clicking on Notes from the Manage Claims screen in FileTrac. Enter your note in the large blank box, if sending an email, make sure the note is formatted with a greeting, message and your signature. 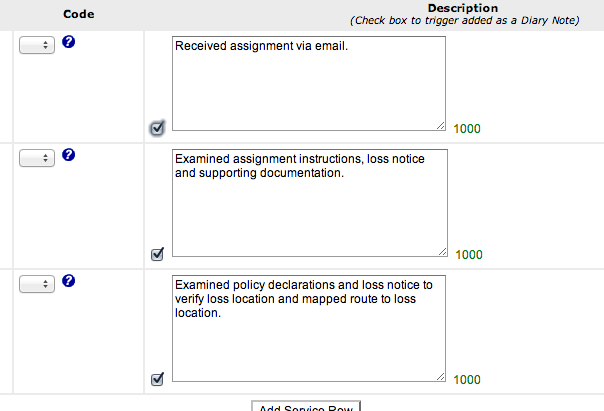 Selecting the check boxes will allow you to send emails and choose recipients. Any of the active support personnel on the file as well as all of the York staff can be chosen as a recipient of your message. Learning the Timelog is one of the biggest keys to your success with York. Because of our arrangements with our clients, we need almost real-time updates when it comes to your activity in the file. When we designed the workflow for entering your time, we set out to make this process as simple as possible. First, confirm that you are working in the correct file. There is nothing more frustrating than perfecting your T&E and discovering you put it all in the wrong file. At the tope of the Timelog Entry screen is the Insured's information and a place to select a date for the activity you are submitting. It is acceptable to backdate by a few days but anything more than a week should be brought to our attention first. We do not use the billing comments section, so there is no need to enter anything in that box. 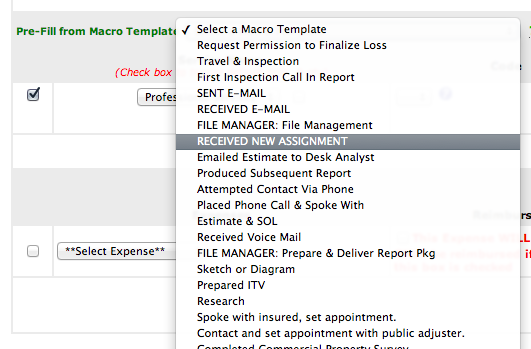 Next you will choose the RECEIVED NEW ASSIGNMENT macro from the Macro Template drop-down. These coincide with the activities on the Standardized Activity Guide. You will see the activity description boxes populate with the pre-approved text. 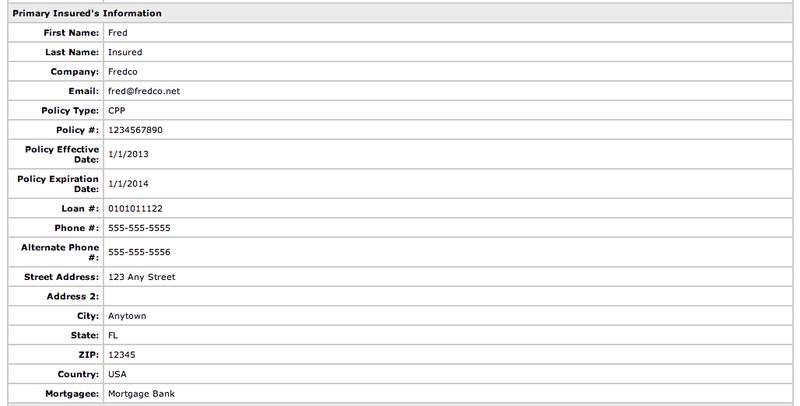 Checking the boxes to the left will populate the notes with the same comments, saving you a step. Note you can resize these boxes by clicking and dragging the corner. Entries are pre-populated, per the Standardized Activity Guide and cannot be increased beyond the amount listed in the guide without approval. Only billing in tenths of an hour will be accepted. Finally, clicking the Submit Timelog Entry button will lock everything in. 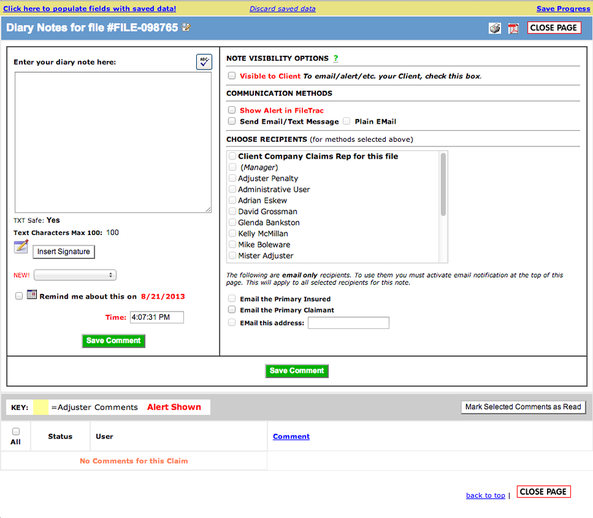 Now its up to you, add an entry for making contact on the claim using the instructions above. WHAT IF I CAN'T ESTABLISH CONTACT? 1. Start with the basics. 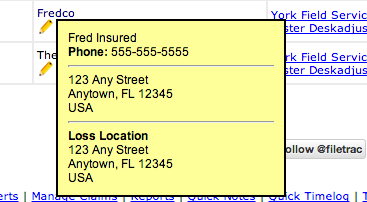 The internet is full of information and chances are your insured's business is online. A quick search will typically yield results. 2. You've searched online, but still have nothing, next try calling or emailing the agent if you have their information, if not, call the DA. 3. Evaluate whether a site visit would yield contact, and then hit the road. Bottom line, never let more than 24 hours pass without trying all numbers provided and one of the above. If you have not established contact in a few days, and you've exhausted the above, its time to talk to your file manager about sending a contact letter.